CCEDNet – Manitoba will continue to work with our members and the Province to address community priorities for building fair, inclusive, equitable, and sustainable communities and economies. In November, 39 CCEDNet - Manitoba members came together to plan the Network's policy actions for 2014. CCEDNet's annual Policy Summit provides an opportunity for members to discuss, debate, learn, and vote on the Network's policy-related activities for the coming year. This year, eleven new resolutions were brought forward, all of which were adopted. Based on our members' direction, CCEDNet - Manitoba will pursue a policy mandate that includes a range specific ideas in support of building stronger, fairer, and more sustainable communities and economies. School may be out for summer, but it's never too early to start thinking about picking up the books again in September. If you're shopping around for post-secondary programs or want to upgrade your skills, consider a degree in a CED-focused field. The community development sector offers diverse and meaningful employment opportunities (for proof, visit our National Jobs page), and Manitoba is home to some of the country's best programs in community development/community economic development. Dr. Kevin Stolarick, the Research Director at the Martin Prosperity Institute in the Rotman School of Management, University of Toronto, will be presenting on economic opportunities resulting from access and inclusion of persons with disabilities. The event will be held on June 4, starting at 8:00am. Focussing on the need for adaptive and inclusive policy, Dr. Stolarick will highlight how building a more inclusive and accessible society can harness the power of all Manitobans with disabilities. Minister Jennifer Howard will be tabling the long awaited accessibility rights bill for First Reading in the Manitoba Legislature on April 24. This landmark legislation will mandate the comprehensive prevention and removal of all barriers to equitable accessibility. According to Barrier Free Manitoba (BFM), "This will be a giant leap forward toward Manitoba becoming an international leader in promoting and protecting the human rights of persons with disabilities." CCEDNet-Manitoba worked with BFM to on this campaign to remove barriers for Manitobans with disabilities, which prevent their full participation in the economy and in their communities [read our policy resolution]. Manitobans need a poverty reduction and social inclusion strategy that recognizes and builds on the important CED initiatives that are building stronger communities across the province. This will require a plan that increases income assistance to those in need, develops a strong social enterprise sector, enhances accessibility for all, improves access to affordable housing, and provides support for early childhood development. The Province of Manitoba is developing a new plan to address environmental sustainability, and is seeking your input. The tentatively titled Green Prosperity Act will define the government's goals, and link all current and future activities and legislation related to environmental sustainability in Manitoba. CCEDNet-MB has submitted a letter with recommendations in an effort to embed CED principles into this legislation (read our letter). Our Network wants ensure the Province takes into account social and economic sustainability in addition to environmental sustainability. We encourage you to submit a submission of your own. The deadline for feedback is March 21. Landmark legislation to address accessibility-rights in Manitoba is on the horizon. In a press release published last month, Barrier Free Manitoba announced that a recent Province of Manitoba White Paper provides the basis for the development of strong and effective provincial accessibility-rights legislation. The White Paper substantially addresses eight of the nine principles outlined in CCEDNet's 2013-03 policy resolution. However, there are still some outstanding concerns that need to be addressed. CCEDNet-MB has sent a letter (see link) to Jennifer Howard to commend the Province on this progress and to encourage them to set targets for success. Recently proposed budget cuts would set the City of Winnipeg further behind other Canadian cities in reducing poverty. The City's preliminary operating budget for 2013 cuts spending on poverty reduction, housing, and neighbourhood initiatives at a time when government leadership and resources are desperately needed to address economic and social inequality. The document indicates that the City will further reduce an already limited role when it comes to partnering with others to reduce poverty in Winnipeg. In the article, Kirsten outlines the consequences of these cuts, and proposes actions that could reverse Winnipeg's downward trend. 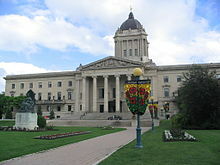 The provincial government is asking Manitobans what they would like to see in Budget 2013. We encourage all of our CCEDNet members and partners to participate to ensure Budget 2013 incorporates the priorities of our Network. CCEDNet-MB has drafted a submission for the Minister which outlines all of our budget related policy resolutions. CCEDNet's pre-budget submission provides recommendations based on our member-adopted policy resolutions. The resolutions highlighted in our letter to the Minister address issues like housing, community-led development, child care, poverty reduction, and employment. On December 11 CCEDNet-MB met with Patti Regan (Manager of Urban Planning, CoW) to follow up on our recommendations for the OurWinnipeg Report to the Community. During the meeting, CCEDNet discussed the value of adopting a comprehensive Poverty Reduction Strategy, a municipal CED Policy Framework and Lens, and an ethical procurement policy. Our representatives also spoke about strategies to create and preserve affordable housing while providing employment development. Finally, CCEDNet-MB emphasized the importance of creating a Food Policy Council. The Canadian CED Network - Manitoba has submitted a letter to the mayor and council of Brandon to ensure that a robust housing strategy is included in the city's upcoming growth plan, Brandon's Roadmap for Growth 2014. Acting on our member-adopted policy resolutions (2012.5 and 2012.7) on housing, CCEDNet urged the City of Brandon to use its newly adopted Affordable Housing First Policy to prioritize the development of new affordable and rental housing on surplus lands. CCEDNet also encouraged the City to use all of the powers within their jurisdiction (ie. inclusionary zoning bylaws, increased density, or the expansion of tax increment financing) to increase and preserve access to affordable and social rental housing in Brandon. We will be following the City's progress on housing, and we look forward to opportunities to work with them and other municipalities to address this province's critical affordable housing shortage. 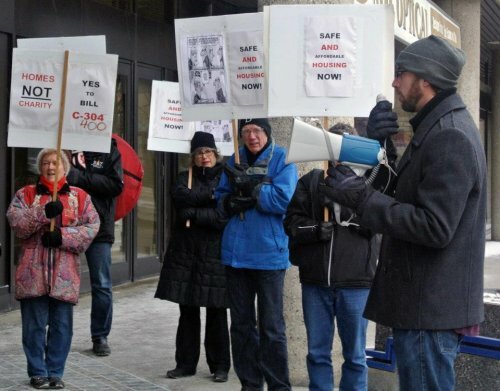 On November 22, Right to Housing and the Red Tent Campaign, along with dozens of Winnipeg housing advocates stood together with other cities across Canada in support of Bill C-400 to mark National Housing Day. This Act, which is going to a vote in the House of Commons on November 28, will ensure secure, adequate, accessible and affordable housing for Canadians. Canada is the only G8 country without a national housing strategy and has consequently become a country of severe affordable and social housing shortages and escalating homelessness. Assiniboine Credit Union & SEED Winnipeg Launch Recognition Counts! We have all heard the all-too-common stories of highly educated professionals immigrating to Canada in search of better lives, but instead find considerable challenges to employment and applying their skills in the field. To help solve this problem, Assiniboine Credit Union has launched Recognition Counts! Micro Loans for Skilled Immigrants. Through this two-year pilot program, ACU will offer micro loans to new Manitobans meet Canada’s re-accreditation and training requirements. In addition, SEED Winnipeg will be providing qualified newcomers with career and financial counselling. The Canadian CED Network - Manitoba has weighed in on the Province of Manitoba's new environmental action plan. 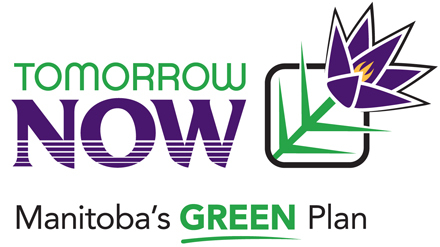 Tomorrow Now - Manitoba's Green Plan outlines an eight-year strategy for protecting the environment while ensuring economic prosperity. In our response, CCEDNet recommends that the plan include a broader definition of the term 'sustainable,' to acknowledge the interconnectedness of economic, social and environmental factors. We have also proposed that the province explicitly include community-owned wind energy, support for co-ops and social enterprises, and strategies to localize our food economy in Tomorrow Now. Despite these shortcomings, CCEDNet recognizes that Tomorrow Now marks a significant step in the right direction towards creating a truly sustainable and robust economy in Manitoba. Today is the International Day for the Eradication of Poverty. To mark the occaison, Make Povety History Manitoba is hosting a press conference at the Manitoba legislative building where key campaign supporters will be speaking out in support of increasing the Rental Allowance for people on Employment and Income Assistance. The Province of Manitoba is currently developing accessibility-rights legislation, and is undergoing a public consultation process until October 20. Barrier Free Manitoba (BFM) is among the stakeholders that has offered recommendations for the legislation. Barrier Free Manitoba is now calling on all Manitobans to help promote and protect the human rights of persons with disabilities by participating in the process. Click here to access an online petition that BFM is encouraging Manitobans to sign and send to Minister Jennifer Howard. The Canadian CED Network's Manitoba office has issued a response to the City of Winnipeg's Our Winnipeg Report to the Community 2012. CCEDNet's analysis includes a series of recommendations that the City can implement to support communities across Winnipeg. The response and recommendations are organized by our resolution topics, including: Housing, Food Security, Poverty, Ethical Procurement, Community Economic Development Policy Framework and Lens, and the Vibrant Communities Charter. The Province should give people on welfare enough money to rent decent accommodations, according to Make Poverty History Manitoba. The rent guideline will increase by 1 per cent as of January 1, 2013, allowing all rents to increase in the private rental market. Landlords are also allowed to apply for an increase above the guideline. This will increase the housing affordability gap for Manitobans relying on EIA. Up to 60 per cent of EIA recipients are persons with disabilities who may be unable to work. Make Poverty History Manitoba (MPHM) is asking for Manitoban’s support to urge the Province of Manitoba to increase the rental allowance for people relying on Employment and Income Assistance (EIA). EIA recipients are provided with a rental allowance that has increased marginally since 1992 when compared to market rents which have gone up by approximately 60-70% during the same period. CCEDNet-Manitoba staff and members are helping MPHM to solicit endorsements and mobilize Manitobans around this important cause. Please read the proposal (linked below) and email Kirsten Bernas at manitoba@makepovertyhistory.ca to add you or your organization’s name to the list of endorsers. It's that time of year for another CCEDNet-Manitoba progress report on the policy resolutions our Network endorsed at the Policy Summit in November 2011. In nine short months, our Network has made great strides by working with our members on policies such as Poverty Reduction, Neighbourhood Renewal Corporations, Ethical Procurement, Housing & Green Jobs, and the CED Tax Credit. It's also time to start thinking about policy resolutions you and/or your organization might like to bring forward at the upcoming 2012 Policy Summit, which will take place this fall. Please contact our office if you or your office would like to become involved in submitting or helping to advance our policy resolutions. Join us October 19th, 2012 at a *new location* - Churchill High School (510 Hay Street). The Gathering is an inspiring annual opportunity for those involved in community development and community economic development to connect, learn, and celebrate together. Planning is in full swing, with confirmed keynote speaker Raj Patel, and the rest of our program in development. Watch your email for bulletins with news, and visit the 2012 Gathering page regularly for updates as details get confirmed. CCEDNet-MB staff and members spoke in support of five of the Network’s provincial policy resolutions on June 11, 2012. In the morning, there was a joint meeting with the Council of Canadians and the Social Planning Council of Winnipeg to address concerns over CETA and its implications for progressive purchasing policies with the Honourable Peter Bjorson, M.L.A., Minister of Entrepreneurship, Training, and Trade. In the evening, CCEDNet promoted two of our resolutions before the Standing Committee on Social and Economic Development while speaking to Bill 7 - the Community Renewal Act and Bill 24 - the Energy Savings Act. Street level retail spaces of 1500 to 9500 square feet are available. Merchants Corner is a 50,000 square feet of mixed-use redevelopment at the corner of Selkirk and Andrews. Included are Retail, Academic and Residential uses. More info: www.necrc.org (see: projects, bottom left) or Jeff Palmer at 988-7180. Option 1: Wednesday, June 27 from 4:00 to 6:00 p.m.
On April 17th, community organizations gathered at the Manitoba Legislature to hear the provincial government unveil its 2012 budget. CCEDNet staff and members were on hand to comment on the Province’s plans to support community initiatives that address the root causes of poverty, crime, and community decline. What we found were half-measures and frozen budgets. Although the budget does not cut spending in key community initiatives, it does little to increase necessary support for important community-based actions. Together with our members, CCEDNet - Manitoba has sent a pre-budget submission to the Hon. Stan Struthers, M.L.A, Minister of Finance. The submission includes 10 budget-relevant recommendations based on policy resolutions that have been developed, debated, and endorsed by the members of CCEDNet - Manitoba. In the submission we call on the Province of Manitoba to ensure Budget 2012 invests in things that matter to our Network, such as co-op housing, community-led development, poverty reduction and employment. Our email addresses will remain unchanged. Brendan Reimer, Kirsten Bernas and Sarah Leeson-Klym can still be reached at (204) 943-0547. *Please note that Brendan's former number, (204) 927-3203, will no longer be in service. Click here for a video tour of the new building! The Canadian Centre for Policy Alternatives, the John Howard Society of Manitoba and CCEDNet - Manitoba along with several other social service agencies worked together to create a report on the cost of the omnibus crime legislation, Bill C-10. The report, titled Bill C-10: The Truth About Consequences, outlines the fact that the Bill only addresses crime once it has happened, and recommends a detailed list of alternatives aimed at preventing crime instead. Click here to read a message from The Canadian CED Network's regional coordinator, Brendan Reimer. Brendan recaps some of the Network's accomplishments from 2011. CCEDNet Manitoba hosted its annual Policy Summit in November to determine our policy directions and priorities for the coming year. Over 40 CCEDNet Manitoba members attended the Summit to discuss, debate and vote on our collective policy agenda for 2012. CCEDNet members approved ten Policy Resolutions on areas including co-operative housing, support for social enterprise and reducing utility bills for low income Manitobans. CCEDNet will partner with its members in the coming year to advance the Resolutions that were identified through the Summit process. CCEDNet also remains committed to working towards achieving our 2011 Policy Resolutions that are at varying stages of progress. On National Housing Day (which fell on November 22) people across the country gathered to raise awareness about Canada’s continuing homelessness problem and to call for government action to address the lack of adequate, affordable housing. In Winnipeg, the Right to Housing Coalition (a CCEDNet member) organized a Red Tent overnight camp-out in Memorial Park on November 21. The following day, campaigners marched through downtown Winnipeg, finishing at the Winnipeg Remand Centre where a press conference was held. In honour of the day, the Provincial Government announced that they would be renewing their commitment to create more affordable housing options in Manitoba. CCEDNet believes that food security and a healthy local food economy are very important for building healthy and vibrant communities. For this reason, we are very proud to be partnering with and supporting Food Matters Manitoba and others in a new community food assessment project in St. Vital. Through this collaborative and participatory process we will be able to identify existing community food gaps and assets. It is our hope that this will provide the information that is needed to develop a community-drive, comprehensive, and systematic food action plan. We hope that this, in turn, will provide a basis from which community-led action toward addressing food security can emerge. The Uniter, the University of Winnipeg's student newspaper recently ran an article on the school's course in co-op management - the first of its kind in Canada. The course is taught by Moncia Adeler, a CCEDNet member and longtime advocate and researcher in the co-op community. The U of W’s co-op management course introduces how a co-op’s objectives and legal structure differ from a conventional business, then shows how mainstream management practices can be adapted to fit a co-operative model. Monica's research into co-operative management led the Manitoba government to introduce the Co-operative Development Tax Credit last year. 9th Annual Manitoba CED/CD Gathering - "Enough for All, Forever"
A new report, Understanding and Promoting Effective Partnerships for CED - A Case Study of SEED Winnipeg’s Partnerships, identifies the factors that have contributed to SEED Winnipeg's successful partnerships and includes suggestions on how to improve future relationships. The project identifies a number of these factors and concludes that they can indeed be used to guide partner selection and development processes to improve the quality of partnerships for all actors. Help make CED a priority this provincial election with CCEDNet Manitoba's Election Guide. CCEDNet's August 2011 Manitoba newsletter is now available! Find out about all the latest CED news and events from around the province and across the country. Our Manitoba office is lauching a new project to profile CED in Manitoba. So far we've completed 35 (of 50) stories of communities working to build fairer and stronger local economies, reduce poverty, and revitalize neighbourhoods. Not all of the initiatives use a fully comprehensive CED approach, but each represents an important component of a CED solution. CCEDNet - Manitoba held it's 2011 Spring Member Meeting last week, on April 28. Highlights from the meeting included discussions on the soon-to-be-created Manitoba Regional Committee as well as our Policy Resolution Report Card. Earlier this month, Premier Selinger outlined a strategy to help cut red tape and make it easier for non-profits to provide services to Manitobans. The plan takes a four-pronged approach, which includes multi-year funding, the creation of an online non profit web portal, and streamlining reporting requirements for non-profits. CCEDNet is excited to see this initiatve announced as our members and many other non-profits have long identified the need for longer term, more streamlined, and stabilized funding. Download The Importance of Policy in CED, in which we call for multi-year funding for non-profits, to learn more. The Red Tent Campaign is a coalition of housing advocacy organizations and individuals, including the Right to Housing Coalition in Manitoba. On April 19 there will be a Red Tent Day of Action to draw attention to the critical housing shortage in Canada. In Winnipeg the action will take the form of a March for Housing, culminating in a press release. The march will convene at the corner of Kennedy and York where there will be brief speeches pointing out a few of the issues that housing has to compete with for federal funding. Shaun Loney's TED Talk is now available online. In it, Shaun shares his innovative approach to poverty, climate change, and crime and tells inspiring stories from the employees at BUILD. Inner city communities are shocked by the surprise move at the Property and Development Committee to reduce by half the Housing Rehabilitation Reserve (HRIR) in the 2011/2012 City Operating budget. The Property and Development Committee voted to remove $500,000 of the $1 million in the HRIR and move it to the Home Renovation Tax Assistance Program. The Daniel McIntyre/St. Matthews Community Association (DMSMCA), a CCEDNet - Manitoba member, was awarded a 2011 Protecting Our Earth award from the Manitoba Eco-Network for its environmental programming. The DMSMCA was rewarded for its work in establishing two community gardens, a community bike shop, as well as composting and active transportation programs. Every year since 1990, the Manitoba Eco-Network has presented Environmental Awards to deserving Manitobans who have "made significant contributions to the awareness and protection of Manitoba's environment". John Loxley's newest book, Aboriginal, Northern, and Community Economic Development, Loxley examines various approaches to economic development, placing each within a broader theoretical and policy perspective, and considering its growth potential and class impact. Accessible and theoretically sophisticated, the book blends international development theory with northern Canadian and Aboriginal realities. At the CCEDNet - Manitoba Policy Summit in November, CCEDNet members unanimously voted to endorse a policy resolution which committed CCEDNet - MB to work towards achieving the shared vision outlined in the Vibrant Communities Charter. The Charter is now ready for signatories, and we encourage you to add your name. The Vibrant Communities Charter can act as a tool for discussion - bringing together non-government organizations, the private sector, government and communities. If you would like to sign the Vibrant Communities Charter, indicating a shared interest in achieving the vision and a willingness to work together, please click here. Follow the link above to download the first visual representation of CCEDNet Manitoba's organizational membership base. If you are a member of our network, we encourage you to proudly display this poster in your work place. Seven CCEDNet Manitoba members and partners were recently recognized for their leadership, vision, and dedication to building stronger and fairer communities through sustainability, co-ops, and credit unions. Congratulations, and keep up the good work! Below is the final, member-approved set of Manitoba policy resolutions that was voted on at the CCEDNet Manitoba Policy Summit on November 16, 2010. This package, titled Toward Strong, Fair, Sustainable Communities, articulates the reasons why each policy was required to make a difference in our CED activities, including a description of the current context, and a clearly stated position that CCEDNet could advance. The document now becomes a tool for all of us to use in advancing our collective policy agenda with policy makers in 2011. Ian MacPherson is an Emeritus Professor of History at the University of Victoria, and is a founding director of the British Columbia Institute for Co-operative Studies. Plan your day for the CED/CD Gathering Conference with this handy program on the Workshops being offered. Help make CED an issue in the upcoming election and ask your candidates for a commitment on these six questions. Drafted by our election committee, these questions introduce some of the CED solutions that our network has been working on at the municipal level. Members have identified these as actions that our City government can take towards community renewal and poverty reduction. These questions have been sent to all council and mayoral candidates. Their responses will be posted on our website and shared with participants at our annual CED Gathering. Quick briefing - Find out about all the work your network is doing in Manitoba: Learning Events, Research, Spark, Policy, Communications, Membership. Quick briefing - Find out about all the work your network is doing in Manitoba: Learning Events, Research, CEDTAS, Policy, Communications. Notes from May 12 member meeting posted! Thanks to all who participated in this member meeting, and thanks also to those who (because of proximity or prior commitments) sent regrets. At this meeting, we discussed some issues members have brought forward over the last few months. These include governance issues, communications, and policy processes. It was good to get together, share information, and hear from you about how your network can better respond to your needs and priorities. The information contained in this brief responds to the Minister’s invitation to help the Province of Manitoba prepare the 2010 Budget. The recommendations that follow touch on five topic areas: Employment Development, Co-ops, Child Care, Housing, Support for Aboriginal people and marginalized communities, Communities, and Food.